How Far is Tangrilla Homes? 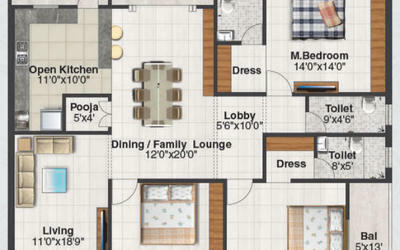 Tangrilla Homes is located on 100 Feet Road of Sahara to Mansooraad, is close to LB Nagar X Roads and ldeally located between two upcoming metro rail corridors connecting Nagole to Hitec City Corridor 3 and connecting LB Nagar to Miyapur Corridor 1. Close to life’s most important landmarks like education, medical, recreation, shopping, Banks, Hospitals, Fruit Market and day to day essentials, and many more. 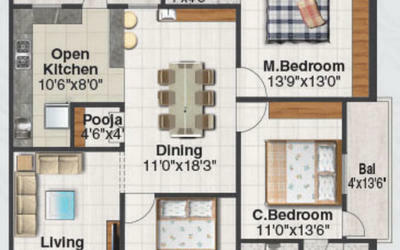 So rest assured, a home in Tangrilla Homes well put you close to what’s most important in life. The project measures approximately 2.20 acres in area with the main approach road earmarked to 30 Meters. Light weight clay bricks in cement mortar with two coats plastering inside and outside. Main door with best teakwood frame and designer shutter with melamine polish & brass fitting; other internal doors with teak wood door frame & HDF designer skin moulded paneled door shutters. UPVC windows with M.S safety grills. Good quality 2’ X 2’ vitrified tiles with 4” skirting. Black Granite slab for kitchen platform with tile dado up to 2’ height and stainless steel sink. Altek finish for total flat. All C.P. fittings are chrome plated of Hindware / Jaquar / Plumber / Marc or equivalent. Anti skid tile flooring for all toilets and 7’0” height dado for walls. Inside: Asian tractor emulsion for internal walls. Asian enamel paint for all frames, shutters and grills. Outside: Texture, Putty & Tiles elevation with Asian Apex. Concealed copper wiring of Finolex / Havells / V.Guard / Anchor Make in conduits for lights, fans; power plug points wherever necessary. 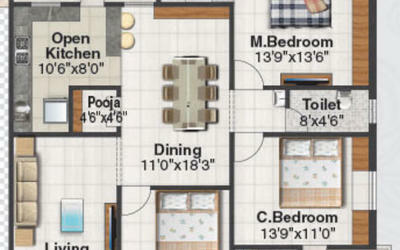 Provision for power plug for cooking range, chimney, refrigerator, mixer grinder in kitchen. Standby generator of kirloskar / Mahindra / Ashok Leyland for lighting in common areas, lift and pumps. water supply is ensured through with overhead tank for both municipal & bore water. 7 No.s of six-passenger lifts with V3F Kone / Johnson make. 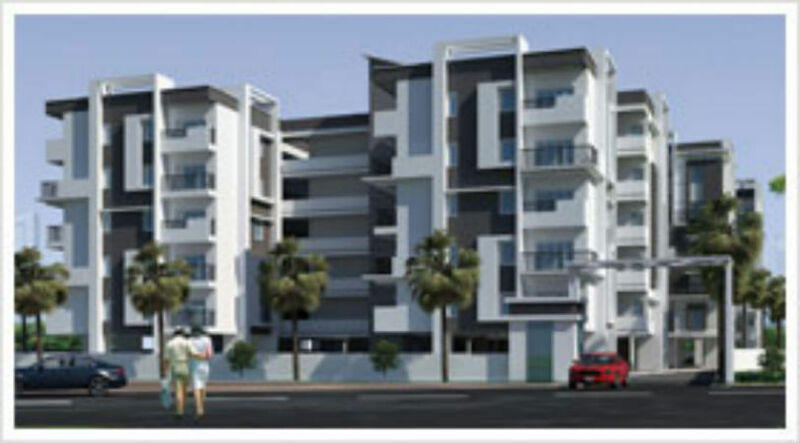 Persons desirous to alter / modify their flat with extra cost. Cement racks, arch and POP borders, etc. optional with extra cost. VAT, Service Tax, corpus fund, maintenance charges and registration charges will be born by purchaser. Orange Avenues Private Limited is a Hyderabad based Real estate company, initiated with a strong belief in delivering 'Comfortable Living Spaces'. Our business philosophy lies in the commitment to create quality building through innovation and knowledge with customer satisfaction as our primary goal. Orange Avenues Private Limited operates in building premium residential apartments and approved plot developments. We aim to stay abreast with the changing trends and standards in the building industry as materials and processes continue to evolve. Orange Avenues Private Limited is run by a young management team with aspirations to make your dream home a comfortable living space. We adhere to the principles of design and the broader concepts of architecture, ensuring that you get a home which not only fulfilling your needs in terms of architecture and economics, but also aids in being a strong and secure foundation for the future.